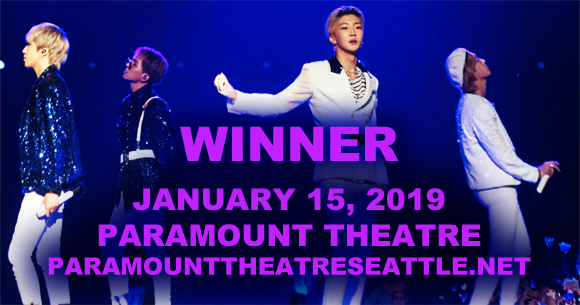 K-Pop superstar boyband Winner are headed to Paramount Theatre Seattle on Tuesday 15th January 2019 as part of their Everywhere Tour! The band is promoting their most recent release, EVERYD4Y, released in April 2018 with their first ever North American Tour, which will bring impeccable choreography and limitless energy to the stage! Life is full of drama, action, comedy, and some music too! See life's beauty, and an occasional touch of madness unfold onstage when Winner starts its performance run at Paramount Theatre Seattle on Tuesday 15th January 2019. Watch how the Paramount Theatre Seattle stage transforms with full-blown sets, mesmerizing lights, well-suited costumes, larger than life scenes and a moving plot brought to life by an astounding cast of thespians. Indulge in this feast of sights, sounds, and a myriad of emotions. Gripping performances and out-of-the-ordinary production values will make this event unforgettably entertaining. No wonder, critics have been raving about this; now it's your turn to experience it. Catch the limited engagement of shows of Winner while its here in Seattle. You don't need to go far. Just click that 'buy ticket' button, right here, right now!